I was born in Mississippi, and was surrendered to an animal shelter there at just 6 weeks old! I’m not sure why, since I must have been the cutest little puppy, but I didn’t get adopted, and I lived in a cage in the animal shelter, looking for a family to adopt me, until I was 9 months old. 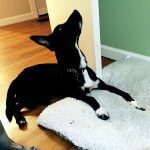 I was starting to feel a little crazy in my cage, and I began pacing around and barking all the time. Then the nice folks from Charlie’s Crusaders Pet Rescue pulled me out of the shelter and sent me to Pennsylvania to a foster home! It was so much better, but I was still living in a small apartment, and I needed space to be a puppy. 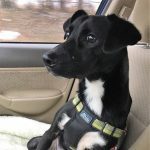 After a month, I came up to Ithaca to a foster home where I could play with other dogs, and run around in a fenced yard. I’ve only been here about a week, and I’m so happy! I get to play with another puppy my age and another mature dog, go for walks in the woods, relax on the couch with both my doggy friends, and spend the nights on a cozy dog bed right near my people. Now that I get to be a regular dog, all my nervous habits disappeared! I don’t pace, I don’t chew on things I’m not supposed to, and my people haven’t heard me bark yet. This is the life! When I first arrived in Ithaca, I wouldn’t let my new people out of my sight, and I followed at their heels all over the house. I’m starting to relax more, and I don’t mind staying asleep on the couch if my people get up. I still like to be close to people, though! I love to snuggle, and I sleep as close to the side of the people-bed as I can, even if this means I’m only half-way on my dog bed. I’m crate trained, and I am okay with staying in my crate while my people are at work, even though the other dogs are free in the house. When they get home, I’m ecstatic, and I bounce around with joy for a few minutes until I settle down for a snuggle, or we go out for a walk. I am pretty good at leash walking. I wear a harness, and I’m so excited to sniff things in the woods that I’m often behind my person and the other dogs, rather than pulling ahead on the end of the leash. Sometimes I get excited and try to be playful on my leash, but I only weigh 30 lbs, so it’s never very hard to hold onto me! When I first arrived, the ground was covered in this white, crunchy stuff, and I had to do the moonwalk every time we went out. I’m definitely not used to this cold weather, but I’m so happy to get to stretch my legs outside that I don’t mind it too much! I like to start my day early with a trip outside to pee, breakfast, and a short walk or puppy playtime. Then I’m happy to go back to sleep for a while, or lie on the couch and stare out the window. Once my people are up and about, I like to play in the house with my toys and the other dogs, or go outside to play in the fenced yard. I’ve recently discovered squeaky toys, and they’re my favorite! 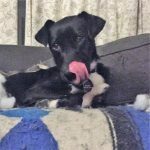 Did you know if you do it right, you can take out the squeaker? I tend to vacillate between play and checking in with my people. I like to approach people and sit back on my back legs with my paws in their lap, staring adoringly into their faces. Sometimes I reach up and give a gentle face lick, but I’m not a sloppy kisser. I didn’t have much training before coming to Ithaca, but I’m learning fast! I can already sit, and I’ve figured out that my people love when I sit, so sometimes I do it without even being asked! I am also learning “off” because I guess people don’t love when I get excited and jump up on them. I’m almost all the way house trained. Actually, I think I’d be fully house trained if my people understood when I need to go out! There are some things that I really really love, like bones, and dog treats. I’ll do just about anything for a treat! I’m very food- motivated, and I run around in tiny circles of excitement waiting for my meals. I’ve learned already that I get fed in my crate, so I run there ahead of my food bowl! In the evenings, I like to go for another walk, and then play and play with my doggy friends until we all pass out on the couch. Then, I’m pretty calm until bedtime. It’s taking me a little while to get into a bedtime routine, but I do eventually fall asleep for the night. I sure would like to sleep up on the bed with my people- maybe my forever home will let me! I love people! Right now I live with two women, but I seem comfortable with men, too. Sometimes I am a little bit shy when new people come into the house, but as long as they have a treat or seem calm, I warm up quickly. It is very important to me to spend lots of quality time with my people. I love dogs! I love living with the two dogs here. 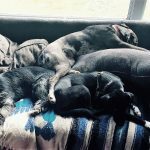 It took me a few days to learn the doggy social cues of the more mature dog, and at first I would leap all over her even when she wanted her space. Now I understand that she doesn’t want me to jump on top of her when she’s sleeping, and we get along great. In fact, we play and snuggle like old friends. I’ve gotten along well with my puppy-housemate since the moment I arrived. Sometimes we play pretty hard, and other times we sleep side by side. I seem A-OK with cats. There are two cats in my foster house here. We are pretty wary of each other. Mostly I’m scared of them right now, which everyone tells me is smart of me, and I try to avoid them, which is pretty easy, since they’re also avoiding me. I’m not sure what will happen as we get to know each other. I am certainly curious! learning new tricks and getting treats! I’ve never had a home of my own! I’m in foster care in Ithaca NY and I’m loving family life; now I just need a forever home! I am a sweet, happy, energetic guy, and I’m excited to have a home of my own. I think I could live with just about anyone who loved me, but I haven’t had much training in my short life, so I could potentially knock over small children, or not know how to be calm around them. I would probably do best in a home with older kids or adults. I would love to live with another dog, especially one who likes to play and cuddle. I would also do great as someone’s co-pilot. I’m the kind of dog who could go everywhere with you! Mostly I just want to live with people who will take the time to train me, and who will spend lots of time loving me and getting me plenty of exercise every day. 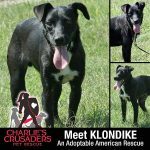 To apply for Klondike, fill out an application from his rescue, which can be found at: Charlie’s Crusaders Pet Rescue. good with dogs, good with mature kids, Lab mix, male, medium, neutered, young. Bookmark.